The nationally reputed garden cemetery in Lexington, Kentucky, is the burial site of many notable Kentuckians. Lexington Cemetery was the first rural cemetery in Lexington, Kentucky. The burial ground was originally established in 1849 on 40 acres of land but the acreage was eventually increased to 170 acres. At the entrance to the cemetery is a Romanesque style gatehouse built in 1890. The cemetery also contains an arboretum and a wide variety of plants, shrubs, trees and flowers. There are also two large lakes that provide a home for ducks, swans, and other waterfowl plus hundreds of large goldfish. 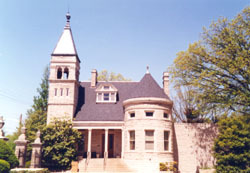 The Romanesque gatehouse was built in 1890, after the original Gothic gatehouse built by local builder John McMurty was torn down. Located in the center of the cemetery is a magnificent monument to Kentucky's famous senator and three time presidential candidate, Henry Clay. Clay served as a United States Senator and Representative from Kentucky during the period of the War of 1812 up to the decade preceding the Civil War. Henry Clay was best known for his attempts to secure a compromise between the states on the issue of slavery. 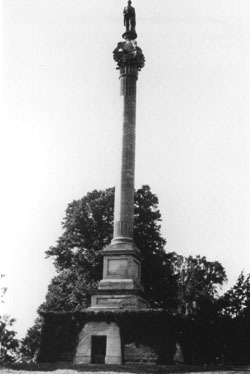 The monument was erected in 1857 after Clay's death in June 1852. The monument was built using native limestone and consists of a 120-foot tall Corinthian column surmounted by a statue of Clay. The remains of Clay and his wife Lucretia rest in two marble sarcophagi on the floor of a vaulted chamber at the base of the monument. The cemetery also incorporates one of eight national cemeteries in Kentucky and contains the remains of both Union and Confederate soldiers as well as veterans of the Spanish-American War. Other notable Kentuckians who are buried in the cemetery include: John C. Breckinridge, Vice-President of the United States under James Buchanan and general in the Confederate Army; James Lane Allen, author of books such as Flute and Violin and The Blue Grass Region of Kentucky; as well as General John Hunt Morgan, daring raider of the Confederacy. The beauty of the cemetery is the result of the conscientious planning by the cemetery's superintendents and on-staff horticulturist. Early maps of the cemetery indicate that the basic design of the cemetery is similar today to its 19th-century appearance. The Lexington Cemetery is located at 833 West Main St. The cemetery is open to the public from 8:00am to 5:00pm year round with self-guided tours. For more information call the cemetery office at 859-255-5522 or visit its website.